I know many people think that sweet potatoes are a fall dish but why should we limit ourselves to only eating the sweet root vegetable during the cooler months? I am still getting sweet potatoes almost every other week in my produce box and have had fun getting creative with them. The other day at the grocery store I saw some turkey breast tenderloins on sale and I decided to cook a mock Thanksgiving dinner. A Thanksgiving feast once a year is not nearly enough! These potatoes are sweet, tangy, and even had a little hint of spice. They will really get your taste buds going. I’m so glad I made these because they were the perfect side dish for our citrus grilled turkey tenderloins. Note: I used Hannah sweet potatoes but this recipe works with any type of sweet potato. That is why these are lighter in color than the typical orange sweet potato you may be used to seeing. 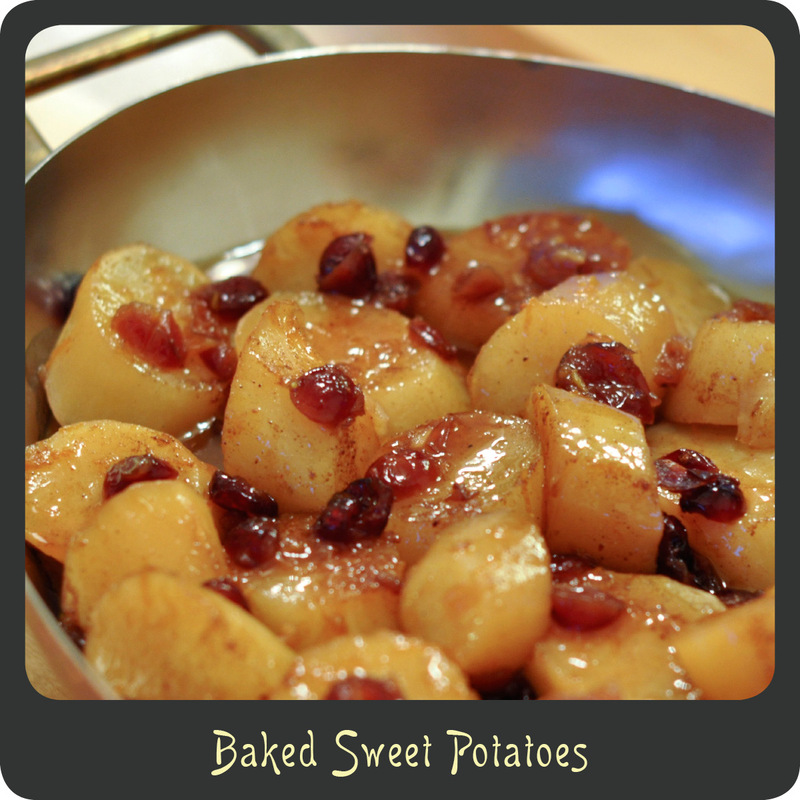 Place the sweet potatoes in a large bowl and add the orange juice, zest, syrup, cinnamon, ground ginger, nutmeg, cayenne, salt, and cranberries. Toss to coat evenly. Transfer the sweet potatoes along with all the juices to a baking dish. Slice the butter and place the pats over the top of the sweet potatoes. After 20 minutes lift the foil and using a baster or a large spoon, pour some of the liquid from the baking dish over the top of the potatoes. Bake for an additional 30 minutes or until the potatoes are tender. Remove the foil and turn on the broiler for 3 minutes to caramelize the top.